I used to photograph bugs all the time. My favourite were butterflies. I’d wander the British woods and downs looking for landscapes, voices in my head . . .
My cards would fill with blurred, out of focus butterflies. Or just empty frames where a butterfly used to be. Taking pictures of small moving things require several factors, most importantly light. Without lots of light, you’re going to struggle, the numbers will never work. When a large critter lands on the dining table at lunch, my kids didn’t yell with fear, they whooped with excitement. What I heard was, ‘Daddy, look at this, you have to take a picture’. 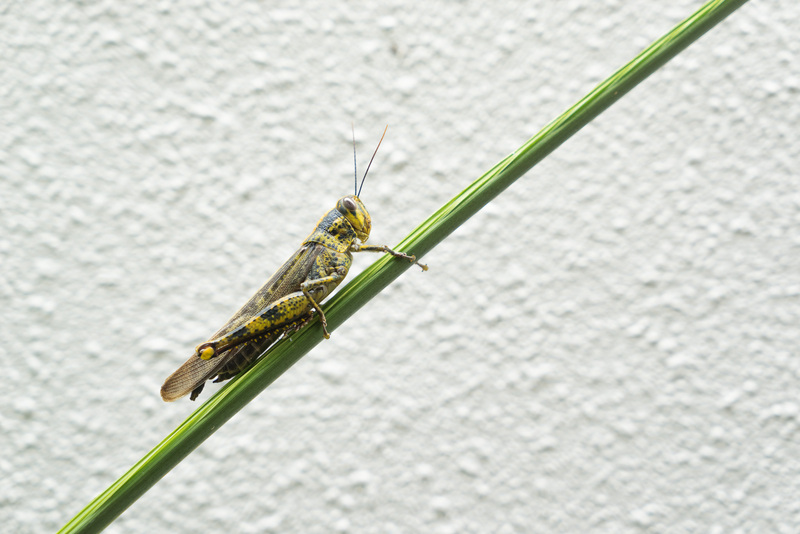 I gently bent a palm frond onto the table, the bug obligingly climbed aboard and then I grabbed my camera. I took a few shots and it flew off, that was the easy bit. Two hours turned my image into the finished piece of graphic art. My eldest had a friend over who later told his mum, he had no idea it took so long to take a picture! As an apprentice at The Arcanum, I’m learning many new techniques and the latest is dodge and burn in Lightroom (LR). I use the brush tool set at + or – .25 exposure and paint. I have a couple of custom brushes for local sharpness, clarity and contrast, all very gentle. This is what took the time and I’m sure I will improve with practice. I knew I wanted to remove the background, a single subject like this needs no distractions. Shot against a bright background should have made my work in Photoshop (PS) relatively easy. I’m still inexperienced in making selections. I watched countless tutorials on Youtube but nothing was working. After too much time struggling with the quick selection tool, I went back to Lightroom (LR), created a high contrast version, opening both as layers in PS. I then saved the selection and used that on the properly adjusted layer. The clean image was returned to LR and converted to Black and White. I wasn’t happy with the result. There was a good tonal range, but the leg looked blurred even though the original is crisp. There wasn’t enough depth and the head wasn’t drawing the eye. This happens with B&W conversions, and I simply start again, sometimes using a different tool like Silver Efex Pro 2 (SEP2). Much happier with the result, the working file was returned to LR. I then sketched an idea of how I wanted the final image to look. I needed depth and separation, the head had to stand out. 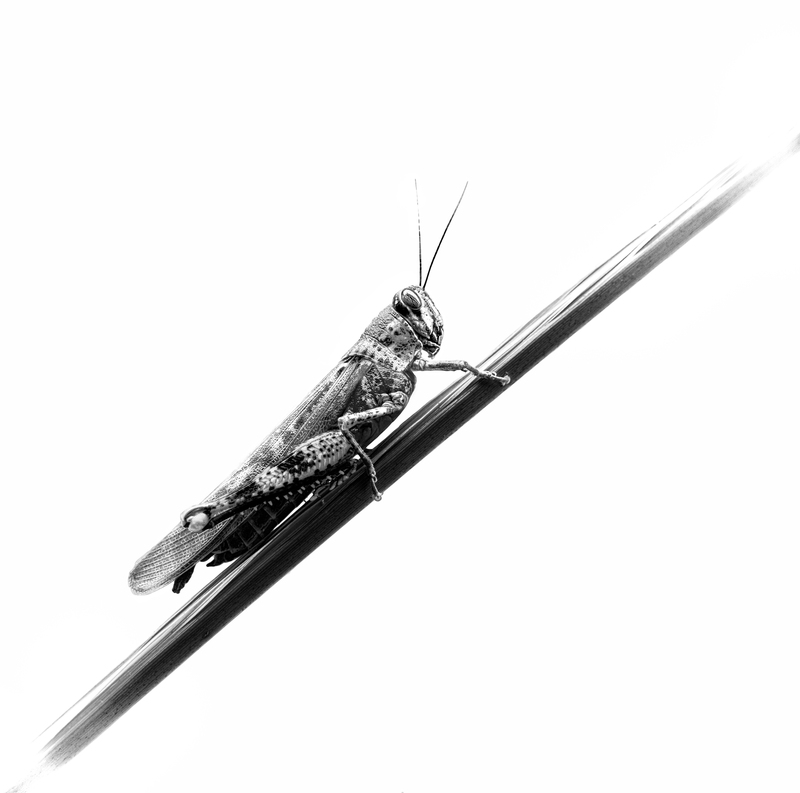 The locust is uniformly camouflaged so I worked on each element of it’s body to create contrast. The wings were very hard as they need midtones so the leg would stand out. I also wanted some contrast between the head and thorax and neck plate to draw the eye to the head. I finally worked on the stem, I didn’t want the strong diagonal to carry the eye out of the frame, so added a white vignette. The image was submitted as part of my level 5 task at The Arcanum in Christian Meermann’s excellent House of Monochromatic Exploration. The critique is top notch, and I learnt a very valuable lesson. I may produce another version without the white vignette and I can add the antenna from an f16 shot I took. It’s high, ISO but I think it could work. The Creation Wars rock! There’s a triangle of numbers, aperture, speed and ISO. Speed: You need speed, after light. In the small world, movements are big. This can include the lightest breath of wind on a blade of grass, invisible to the naked eye, even if you don’t think there’s movement, if the bug is on a plant, assume there is. Normally you’d work with a speed higher than the focal length of the lens, so a 50mm macro would require 1/50 second. In the macro world you need to double that, so 1/100 second. ISO: This depends on your camera. Ten years ago I upgraded my camera which could shoot at ISO 400 without noise becoming a problem. Now with improvements in technology, I’m happy to shoot at 1600. This gives me more speed. Aperture: Now you’re left with aperture. The biggest mistake budding macro photographers make is thinking you need wide aperture and narrow depth of field, it makes sense, you want to isolate the subject from an often busy background. But the distances when you’re close up become tiny, sometimes only 1mm. I used a simple rule for my setup, a regular dslr and 100mm macro. At full macro, 1:1, 30cm from the subject, divide the f number by 4 and that would give you mm of depth of field. So f4 gave you 1mm, f16 4mm. Not a lot of room to play with. Double the distance, half the subject size but four times more depth of field, so now the f number is the same as mm of dof. This might sound complicated, but it’s not. With a 100mm macro on my camera, I would set speed to 1/200 and ISO 400. I’d see a bug, guess how much I wanted in focus, say 6mm and see what aperture the camera came back with at 60cm. If it was f5.6, I could take a shot from this distance. If it was f8, I could get a little closer, if it was f2.8 or the f number was flashing, then move on. This is how I work, you have three variables and you have to work out an order that works for you. Although the camera was setup in speed priority mode, I’d switch to aperture priority mode and dial in f5.6 and then move in and out until speed was 1/200 or less and take the shot. I could do all this automatically without taking my eye from the view finder and often took less than a second. You sometimes have to move fast when the subject is alive. If I had more time, I could recompose, add or remove depth of field. With the low light of an English woodland, my success rate was poor, I’d often compromise on speed and get blurred results. A family holiday took me to Italy and so much light I could shoot f16 without thinking. I eventually moved onto fungi, nuts, leaves and stuff that didn’t move. My current set up doesn’t include a macro lens, but my 24-70mm lens on a full frame camera gets me within 40cm at 36 mega pixels, so I can crop a little. I’ve worked out some new numbers, and my available depth of field is just under twice the aperture – f5.6 is approximately 10mm and f8 15mm. I now live in Singapore and I have bigger bugs and way more light. I don’t go looking for them but when the opportunity arrives, the memory muscle kicks in and I end up with shots like this. I had lots of light but had to compromise on depth of field, the rear antenna is blurred, out of focus. Depth of field calculator – useful tool. I prefer to have the numbers in my head or very simple formulas like the examples I’ve used. If you can’t do this in a second, you may well loose the shot.